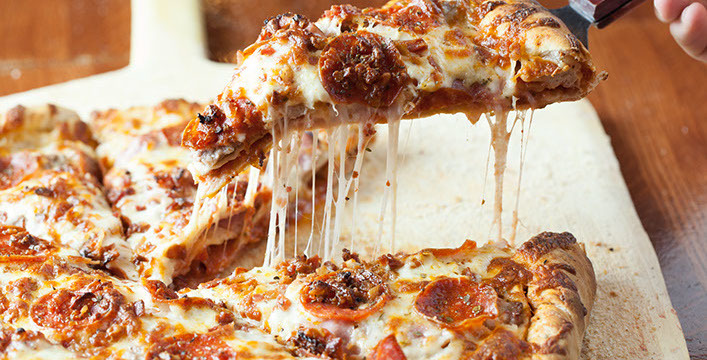 Delicious Chicago-Style Pizza, Pasta And Sandwiches. Print The Coupons Below And Come In Today. Excludes catering. With coupon only. Not valid with any other coupon. Must present coupon at time of order. Coupon void if altered. Expires 05/05/2019. Does not include taxes. Excludes catering. Not valid with any other offer. Must present coupon at time of order. Coupon void if altered. Expires 05/05/2019. Toppings additional. Must mention coupon when order. With coupon only. Not valid with any other offer. Must present coupon at time of order. Coupon void if altered. Expires 05/05/2019. Make plans now to enjoy the next college or pro game by choosing Sir Nick’s authentic Chicago-style pizzas for a weekend party at your Hoffman Estates or Bartlett, IL home. Whether you’re watching a super football game, college basketball event or pro hockey OT play, sports fans can place an online order and not miss even a 3-second violation. Our delicious pizzas are perfect for game-watching and there’s no penalty for illegal use of hands to the face. Sir Nick’s restaurant menu selections include wings, sandwiches and pasta dishes, too. Create your own pie and pick six toppings if you’d like, we have loads of fresh choices. And, you’ll love the large portions at small prices. Or, make yourself feel like you’re at the ballpark and get your hotdogs here and burgers, too. Rebound and score by using our online printable coupon to help you save on our already low prices. Swish! Fresh Chicago-Style Pizza, Crunchy Thin Crust Pizza, Delicious Deep Dish Pizza, Hot Dogs, Gyros, Italian Beef Sandwiches, Meatball Sandwiches, Chicken Dishes, Pasta Dishes, Salads. Online Ordering, Dine In Restaurant, Pick Up & Carry Out, Fast Delivery Services, Catering, Ask us about our Party Packages!. Sir Nick's Pizza offers pizza delivery service to the surrounding Illinois cities of Hoffman Estates, Palatine, Barrington, Bartlett, plus Streamwood and Hanover Park.